Eloise KirnMe, wearing a cheesehead while eating cheese. 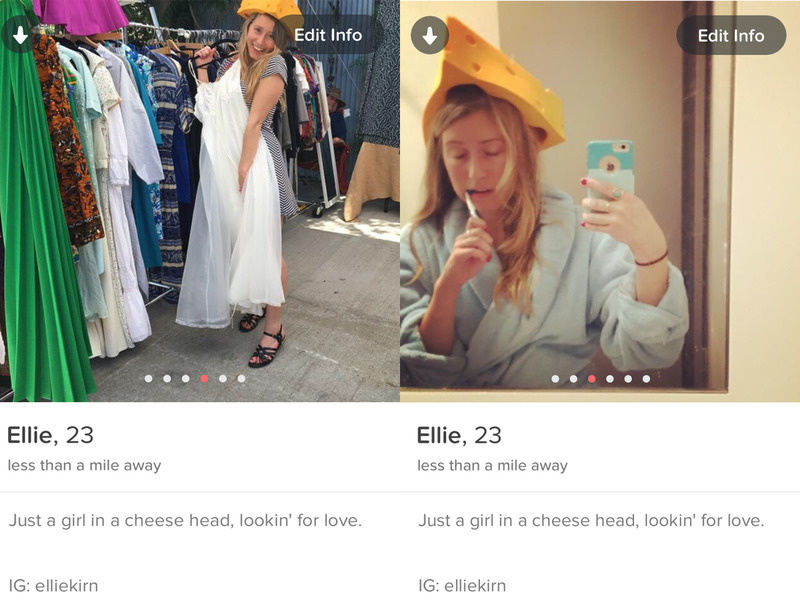 I recently engaged in a little Tinder experiment: I wore a cheesehead in all of the pictures I uploaded to the dating app. 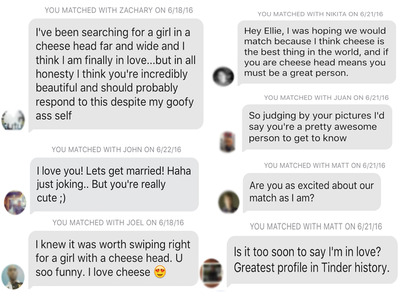 I wore the cheesehead to examine two hypotheses: 1) Everybody loves cheese, and 2) Humour is the sexiest quality. I should explain that I have recently become a cheese reporter of sorts. On my first day at INSIDER, I was assigned to write a video on Swiss cheese. 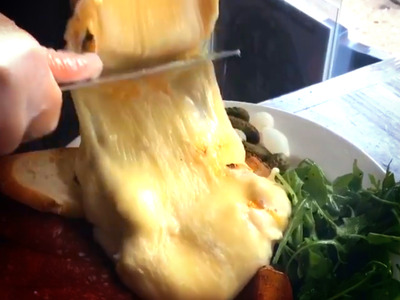 The video went viral and I’ve been on the cheese beat ever since. My first article featuring cheese. She had a point about humour and friendship, so I decided to put her theory to the test. I tried to make the first photos as generic as possible. They had to visually convey what most people write in their bios: “I’m adventurous, educated, and well-travelled.” This way, the only difference between me and your average looking, 23-year-old blonde, was the cheese. 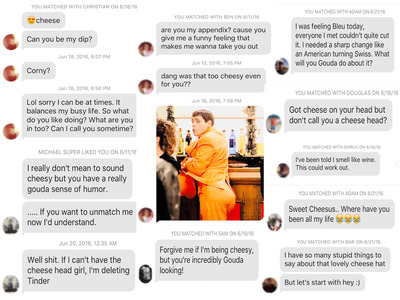 The focus was to hook possible matches, while progressively taking the cheesehead to more absurd levels. Photos had to walk the fine line between psychotic and cute, so I posed on a bed eating cheese while reading the book On Romance Writing, took pictures in the rain, trying on a wedding dress, and first thing in the morning. On average, I swipe right approximately 20% of the time. For this experiment, I swiped right around 50% of the time. Of course, this meant getting more matches, but the ratio of messages to matches also increased. 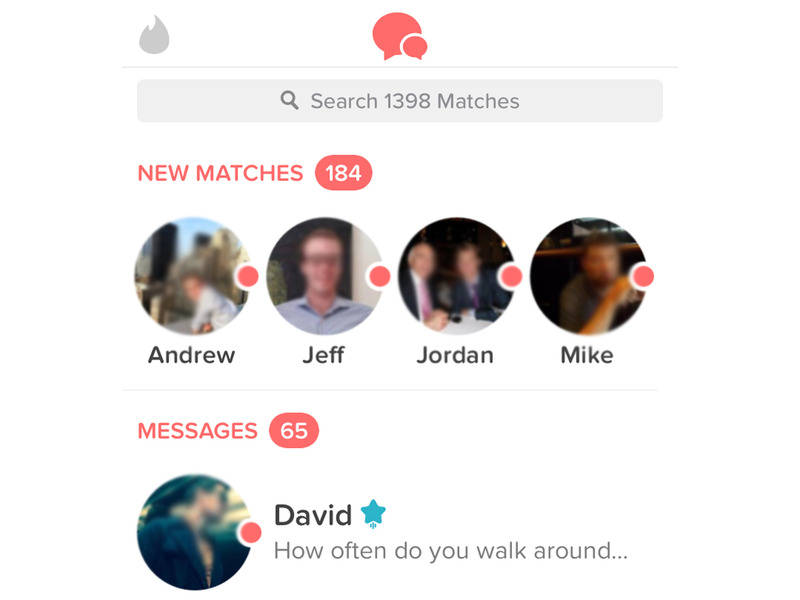 In only two weeks I matched with over 300 people and received messages from over 60% of them. The photographs weren’t any more or less attractive than my usual ones, and my bio actually contained less information. 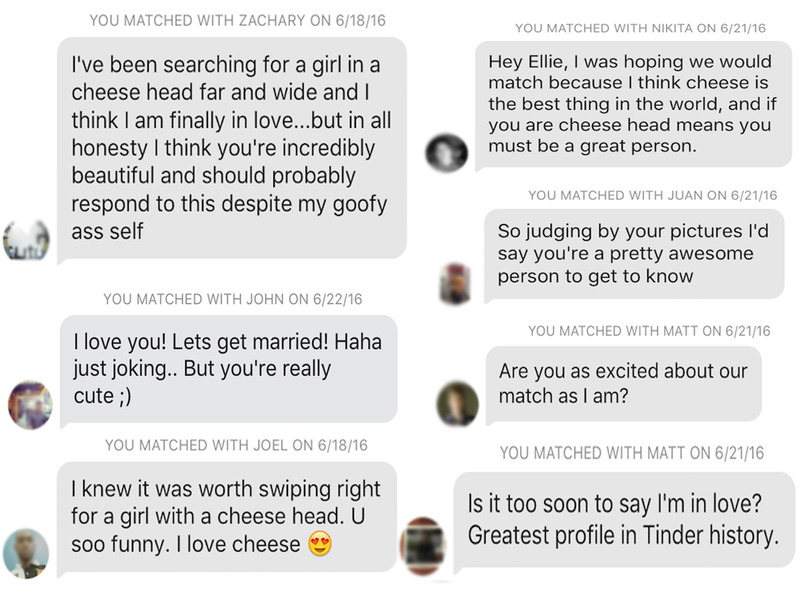 Messages began to come in fast and the amount of people I matched with easily quadrupled. But it wasn’t just quantity, it was quality. All of a sudden, people had something to say. Besides the generic “hellos” and “sups” there were suddenly context-specific jokes. Guys were attempting to say something nice or clever that they hadn’t already messaged to ten other girls. The cheesehead allowed me to stand out, but also provided an easy conversation starter. Surprisingly, none of the messages were explicitly sexual. I realised that the secret to landing a date on Tinder isn’t looking hot — it’s being approachable. If you want to meet a genuine human being, all you’ve got to do is be weird, give people something random to talk about and listen to your mother. Or buy a cheesehead. That works too.